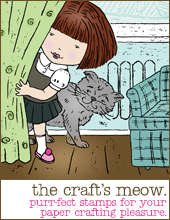 Hi and welcome to the July blog hop with The Craft's Meow! You should have arrived here from Angi's blog but if you missed anything pop back to The Craft's Meow blog for the full list. Today's theme is Mabelle R-O stamp sets! I used one of my favorite sets Sweet Birthday. I stamped the balloon and stars pattern paper using elements from the stamp set. 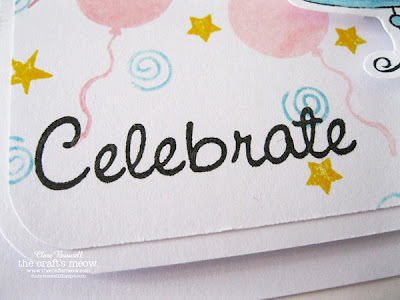 The balloons are stamped with VersaMagic Pixie Dust and Pink Petunia, the stars with Impress Lemon Yellow and the swirls I stamped using Tumbled Glass Distress Marker. The sweet cake I stamped and colored with Distress Markers (Spun Sugar, Worn Lipstick, Mustard Seed, Tattered Rose and Tumbled Glass). 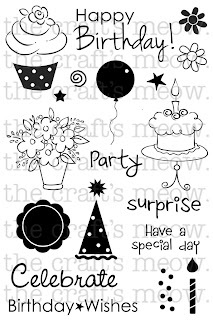 You could stamp some fun background paper for party invitations using this same idea using whatever colors you like! The sentiment is also from Sweet Birthday. I kept the rest of the card pretty simple with just some pink patterned paper at the top. Instead of a bow I tied a simple knot using twill ribbon. Here's the stamp set I used on my card today. Adorable! Your papers matching this sweet cupcake are spot on! Love the design of your card and the lovely color palette - TFS! 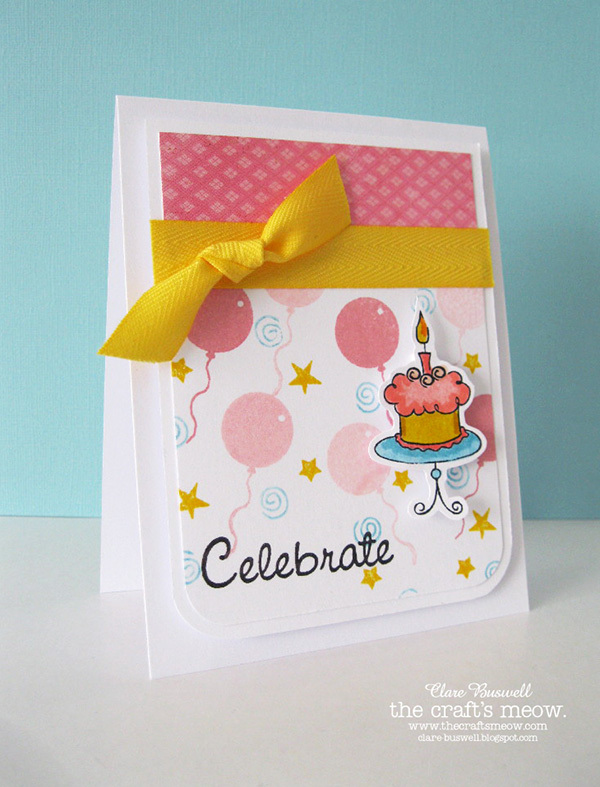 Very pretty card - I like how the cake is popped up and the yellow ribbon looks great. Super cute and super sweet! Love this birthday card. I just LOVE your card, I think the cake is my favorite out of this great stamp set! Love the color combinations. I think the cake is my favorite of all, but oh my it's so hard to choose. Great card. I love how you created your own background paper with the stamps. Love the cake and what a great design! Wonderful card! I like the background you made with the stamps! This is a great card! Love the colors. Very cute--I like the stamped background. I love this card! It's so festive. I love the colors and the background you created along with the very yummy cake! So very sweet! Thanks for sharing! What bright, happy colors. I love the layout! Wonderful card. Everything balanced and pretty and well colored. Like how you popped the cake! Adorable card. Clean and simple. Loving this stamp set. What a great card! Love the stamped background and "layered" cake! Love your colorful card. Such a cute set. Making your own background paper is perfect. Great job coloring the cake too. Wonderful card. So sweet. It looks perfect for a special little girl's birthday. Such a colorful and cute birthday card. Beautiful. Love the girlie colourway. Thank you. Sweet card made with the Sweet Birthday set! Love the fun colors! 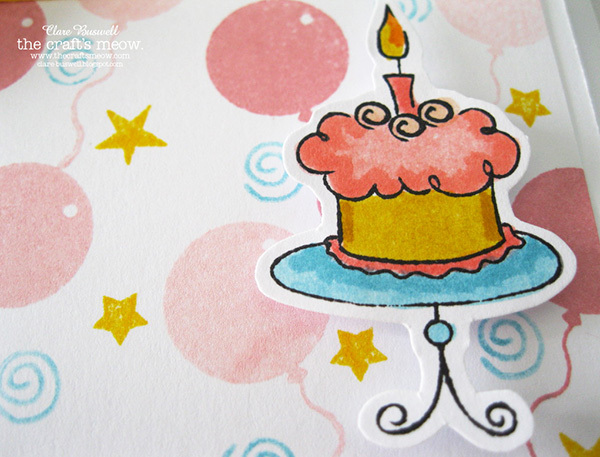 Adorable...love how you stamped the background and then layered the cake on top. I like all of the stamps in this cute set! A fun card! Oh man! I love this! Such happy colors and great coloring! Gorgeous card, love your coloring!! Love your card! 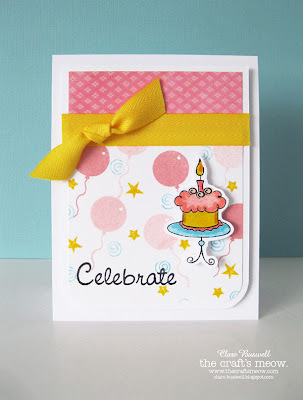 Your stamped background looks awesome, and goes with your cheery yellow ribbon so well! And that cake image is so cute. Thanks for sharing. Gorgeous card Clare, love your background too. That cake is so cute too. This is lovely--and I love how the yellow ribbon really stands out, too!